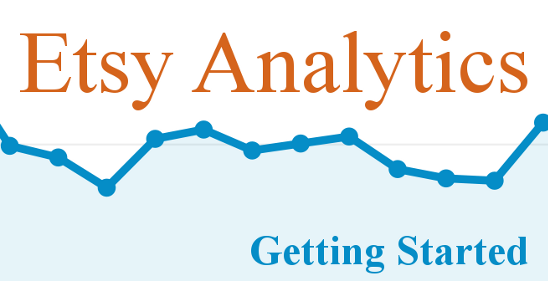 This is the first post in a series to help you use analytics to increase your Etsy sales. We'll use a combination of Google Analytics for Etsy and Etsy's built-in Shop Stats to access all the analytics data available to you as an Etsy seller. In this installment, I'll show you how to enable Google Analytics for your Etsy shop, and I'll introduce you to the Google Analytics interface. ...And really, that's just a small sample of what you can learn with analytics data. Even if you're new and only getting a few visitors a day, you should set up analytics now to start measuring visitor stats. The sooner you add it, the sooner you can begin to learn from it. Get it set up now, and you'll be so glad you did when your shop gets busier. In fact, you'll be able to use the analytics data to find out how your shop got busier, which can help you get even busier! Click the "Sign Up" button. On the "Create New Account" page, you'll have to fill in a few fields. First, in the "Account Name" field enter your shop name in this format: shopname.etsy.com. For the "Website's URL" field, select http:// from the dropdown menu and enter www.etsy.com. Set the time zone dropdown to your local time. After you've added your personal settings, review the data sharing settings and decide if you'd like to enable or disable data sharing. Then, read the user agreement. After you accept the user agreement, you're signed up! On the next page you'll get your Web Property ID number. Copy and paste that somewhere so you have it handy for our next step. Existing Google Analytics users: If you already have a Google Analytics account (for your blog or another website), you don't need to sign up again to track your Etsy shop. Instead, you can add your Etsy shop as a new account within your Google Analytics account. To do this, click the "Admin" link in the orange stripe up top. That will take you to the "Account Administration" page. Press the "New Account" button, and follow the steps above for entering your shop information and getting your new Web Property ID. Etsy makes it very easy to add your Google Analytics tracking code to your shop. Go to Shop Settings > Options, and click the "Web Analytics" tab. Enter your Web Property ID and press the Save button. That's it! Google Analytics will start collecting data from your Etsy shop within 24 hours. Google Analytics is a massively powerful tool, and the interface can be a bit daunting if you're new to it. I'm going to introduce you to a few interesting features to help you get started, and we'll build and expand upon what you learn today in future installments. This is usually the first page you'll see when you log into Google Analytics. On this page you'll see how many visitors you've had in your chosen date range (default is the past 30 days). You'll also see total pageviews, pages per visit, average visit duration, a pie chart representing how many of your visitors were new vs. returning, and a breakdown of what language your visitors speak (based on their browser settings). Many analytics users never venture beyond this page. While that's understandable, those who stop here miss out on what makes Google Analytics so awesome. Like, for example, Real Time Analytics. Warning: Real Time analytics are addictive. Use with caution. From the Analytics dashboard, click the "Home" link. Click the "Real Time" link in the navigation column at the left, then click "Overview". Now you'll see visitors in your shop, live! You'll see how many visitors are in your shop, where they came from, where they are in the world, and what page they're looking at. Wooo! Please promise me you'll remember to tear yourself away for dinner every now and then. As a default, the "Traffic Sources" overview shows you a pie chart with a breakdown of the different ways your visitors found your shop. You can see some of their Google search keywords in the "Keyword" column. I say "some", because you may find that the very frustrating "Not Provided" keyword is dominating your keyword list (I'll point you to some resources for working with "not provided" results in the reading list at the end of this series). If you click the "Referral Traffic" Source link, you'll see a breakdown of all the links around the web that sent visitors to your shop. Very handy for tracking the value of guest posts and sponsored links! Ok, you're all set to start tracking visits to your Etsy shop, and you've had a little look around at what you can learn from your analytics. Google Analytics usually starts working quickly, but it can sometimes take up to 24 hours to get working. Give it at least that long before you worry, but if you've gone over 24 hours without data, retrace your steps and make sure everything's in its right place. Ready to move on to the next step? Read Part Two: Using Shop Stats.